When working with microscopes you have may have come across the terms field size, field of view or field number. This post will help explain each. N - Motic uses this letter to indicate a higher quality (such as a plan objective versus a standard achromat objective) of eyepiece lens. 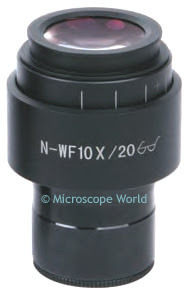 WF10x - This is a widefield 10x eyepiece. 10x refers to the magnification of the eyepiece. Total magnification of the microscope is a combination of the eyepiece and the objective lens being used. 20 - This is the field number, in this case the eyepiece has a field number of 20mm. Eyeglasses - This image explains that these eyepieces are focusing eyepieces. Field number is the diameter of the eyepiece lens and is most often expressed in millimeters. Field of View (FOV) is the amount of the object that can be seen with a particular optic combination (eyepieces + objective lens). It is the circular area that is seen when looking through the microscope. The field of view decreases when the magnification is increased. For example, if you are viewing a coin and zoom in to see more details, you see less of the surface area of the coin. In most cases, you can use the formula below to determine the FOV or field size. Field Size = Field Number ÷ Objective Magnification. Remember when using the above formula that if auxiliary lenses are being used in addition to the microscope objective that they must be included in the objective magnification.